Christmas Crafts For Kids – Decorations Made From Bread! Christmas crafts for kids are very sought after at this time of year. Yes seriously, I made these Christmas decorations from bread. After making the first batch, I soon realised this is a brilliant addition to any mum's repertoire of Christmas crafts for kids. They are so cheap and easy to make and, they look really trendy. You can find my step by step video tutorial on how to make these Christmas decorations here on YouTube. I have seen decorations like this in the fashionable places where they sell ridiculously expensive home decor items to people with money to burn. There seems to be a thing going on for decorations that are quite textured with dense fibres. Well guess what, that's what these look like! And for a fraction of the cost. 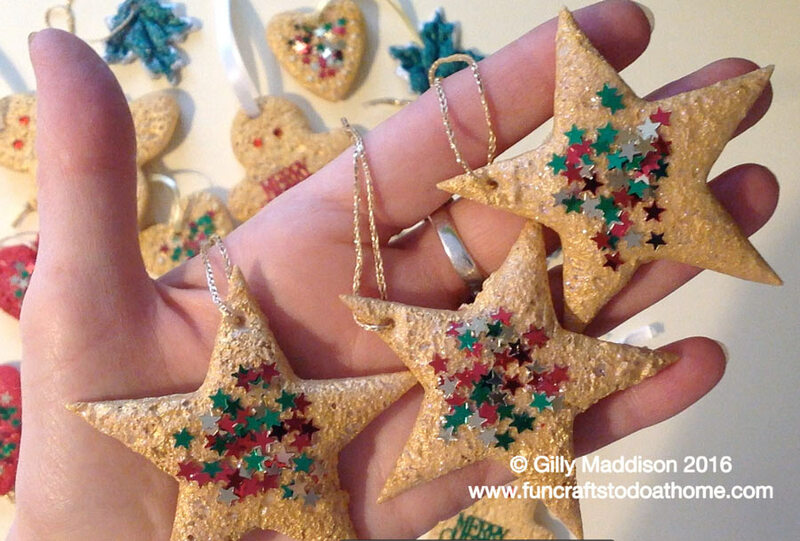 If finding Christmas crafts for kids is a priority for you - try these gorgeous decorations. With supervision, children as young as four could easily do this and have lots of fun painting and sticking. Please note - If you buy anything, I do get a small commission but, these are simply suggestions to help the people who want that kind of support. So often after watching my videos, people ask me where they can get certain products so now, I create these links. But of course you can get similar products elsewhere online or in craft shops. Below are some links for US readers to help you source resources similar to the ones used in my tutorial. I do receive a small commission for anything that is sold but these are simply suggestions to help you if you need it. People often ask me where to get certain products that I have used and so now, I create these links. Of course you can find these products in other places both online and in your local craft shop. Let me know if you make any pretty decorations from bread. Scroll down to where it says 'leave a reply' and let me know if you are going to try this or have any other ideas for inexpensive Christmas crafts for kids. Thanks for this Gilly, We too are doing Christmas Crafts for Children on Thursday this week and on Sat Nov 19th in th eApex, not quite as cheap as yours perhaps but not mega expensive either. Just a couple of sheets of card, some paint and and 2 Elizabeth Shaw chocolates to make some Christmas tree hanging decorations. Oh yes – you are aren’t you! It sounds brilliant – I may come along and take pictures of the results to put up here.